Pink Lemonade Thyme is a Mountain Valley Growers' introduction. 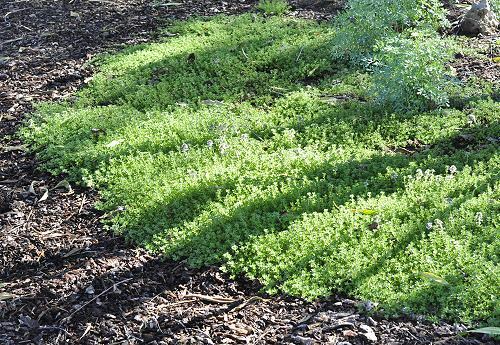 It is unique because it is a non-variegated lemon scented ground cover thyme with profuse pink flowers. Most lemon scented varieties either have white flowers like Lemon Frost Thyme or bloom very little. 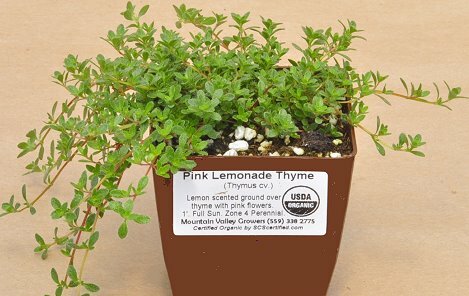 Pink Lemonade Thyme has dark green, closely spaced leaves which makes for a dense and fast growing ground cover. It is also nice because it blooms later in summer after many other thymes have finished. We are also having luck with it growing well in partial shade as the picture above shows. This area does get about four hours of direct sun off and on throughout the day with filtered light the rest of the time. 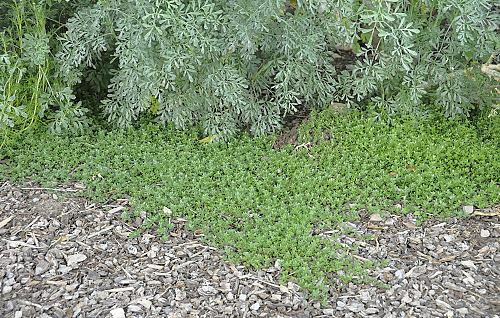 If thyme does not get enough sun, it will grow lanky as it reaches for sun. The photos above show how the spreading wonder that is Pink Lemonade Thyme. Only two or three pots were planted originally near the gray Rue plant in the top photo. By the end of the first year it spread out about four feet in all direction. The next spring it flowered a bunch. 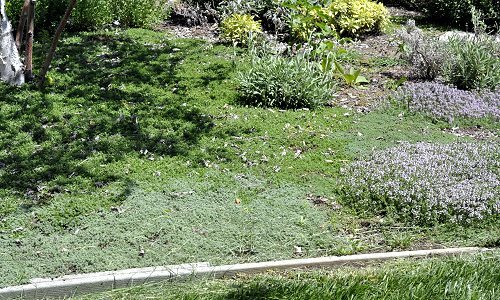 After three years the last photo shows how wide spread the Pink Lemonade Thyme had become covering about 50 square feet. The next year it will swallow the gray Woolly Thyme in front. The pink flowering Heretus thyme in the back and the pink flowering Caraway Thyme in the front are two of our earliest blooming thymes. This thyme does not have a lemon flavor strong enough for use in the kitchen. For cooking, use Lemon Thyme, a tall prolific grower, full of citrus flavor. Pink Lemonade Thyme is often included in our 36 Pack Alternative Lawn Assortments. This plant is often available in plug trays. These trays hold 128 of all the same plant. They are a great low cost way to fill a lot of space. Each cell is 3/4 of inch by an inch. Check here to see if Pink Lemonade Thyme Plug Trays are available.